Delivery of oxygen: Possibly the single most important function of the blood that runs through our vessels. We breath air in, the blood in our lungs picks up the oxygen, and after a quick run back through the heart, that oxygenated blood is pumped out to the tissues of the body. The oxygen we breath allows our cells to carry on the never ending cycle of work that they do to keep us alive. Oxygen is part of the final step cellular respiration, the process by which our mitochondria produce ATP, the energy currency of our cells. The purpose of this lab was to understand the impact that different activities have on basic metabolic rates. Different activities require more or less from our cells. More strenuous activities require more energy; more energy produciton requires more oxygen. The rates we were to measure were pulse, respirations, and systolic and diastolic blood pressures. We were to select 3 different activities to perform. After completing each activity, we were to measure the 4 metabolic rates and compare the mean of each to the mean of our baseline rates. HOW DO I THINK MY METABOLIC RATES WILL COMPARE TO BASELINE AFTER....? My hypotheses are listed in the table below. I borrowed a Mabis SmartRead blood pressure monitor from my aunt. This piece of equipment measured systolic blood pressure, diastolic blood pressure, and pulse. The photo below shows the monitor with the cuff wrapped around my bicep. Once the cuff is wrapped tightly around the bicep, there is a blue button that you push. The monitor fulls the cuff with air, slowly releases the air, and provides the readings in the digital display. To measure my respirations per minute, I used my wristwatch that has a second hand. 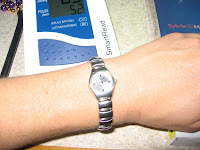 As the blood pressure monitor was taking my other metabolic measurements, I would keep an eye on my wristwatch and count the number of respirations in 30 seconds. I then took that number and multiplied by 2 to determine the number of respirations per minute. The first activity I chose was eating. 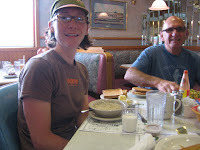 The picture below is of me and my dad getting ready to eat breakfast. The second activity I chose was a 1 mile time trial on my bike. 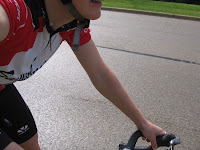 The picture below is of me riding after I completed the second repetition. 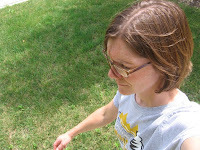 The third activity I chose was a brisk walk around the block. The picture below is of me walking after I completed my first repetition. The table below shows the raw data. Included are all four metabolic rates at baseline (5 reps) and after each of the 3 activities (4 reps). Also included is the mean for each. In the discussion below, when I refer to any of the metabolic rates, I am referring to the mean. I hypothesized that my pulse would go up as compared to my baseline after each of the 3 activities (eating, biking, walking). I was incorrect when I hypothesized that my pulse would go up after eating. 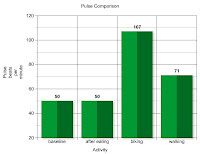 In fact, my baseline pulse and my pulse after eating were the same. My hypotheses about my pulse going up after biking and after walking were both correct. 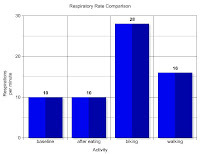 For respiration rate, I predicted that it would stay the same after eating and go up after biking and after walking. All 3 predictions were correct. 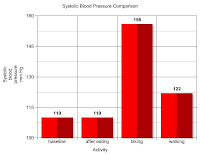 I hypothesized that for systolic blood pressure, each of the 3 activities would cause it to go up. My hypothesis for eating was incorrect. 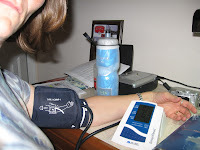 In fact, my baseline and after eating systolic blood pressure were the same. My hypotheses for biking and walking were both correct. 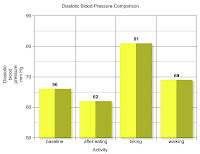 For diastolic blood pressure, I predicted that it would go down after eating and go up after biking and walking. All three of these predictions were correct. I did encounter a few issues during this experiment. 1. Error message on blood pressure machine - After completing the second repetition of my walk, I tried to measure my blood pressure the monitor gave me an error message. I had to take a second reading which allowed all of my metabolic rates to decrease towards baseline. 2. Time lapse - After my first bike ride, I had to walk into the house to take all 4measurements. Again, this delay allowed my body time to recover. After this I left all necessary equipment in the garage for quick use after biking or walking. 3. Time of day - I took baseline measurements at different times of the day, because I figured my activities would be performed at different times of the day. Ideally, measurements for baseline and all activities would be performed at the same time every day, as baseline metabolic rates vary throughout the day (ie - pulse and blood pressure is lowest in the morning). 4. Measuring respirations - It is very difficult to take this measurement on your own. As soon as you concentrate on counting the number of respirations, you are aware of your breathing rhythm. It is very easy to voluntarily control this rate without meaning to. In general, physical activities are going to increase metabolic rates. These activities consume energy more quickly than sedentary activities do. In response, your body needs to get more oxygen to its cells more quickly. You start breathing harder/faster(respirations) and your heart starts pumping faster (pulse) to move the oxygenated blood to your tissues faster. The faster rate of blood flow causes your blood pressure to rise.